We are gulping down "several ounces of amniotic fluid every day, both for hydration and nutrition and to practice swallowing and digesting." 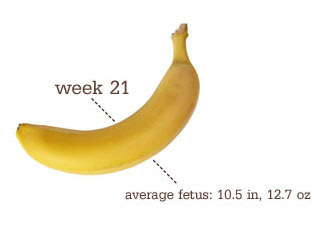 Also at 21 weeks...? The twins have decided to make their presence known. Apparently the hunger, growing belly and aching back weren't clues enough that I was pregnant... now they have to go and kick me from the inside out. At least they aren't rude yet -- they either aren't doing it when I'm asleep or they just haven't mustered the strength yet to knock me from slumber. To make matters worse, it seems they are on different schedules. While the dude is making his presence known, little princess is sleeping - and vice versa. For those of you who are wondering what it feels like in the beginning, it's kind of hard to describe, but here goes. The first couple times, I mistook it for gas, because let's face it, these little shrimps are pushing my insides all over the place and are making me eat all these crazy foods... But it felt like gas with a flutter, and then it would happen in a different place. I felt the little pea first and then a few days later little man joined in the fun, so I knew that this could not be air build-up any longer. Michael is taking pleasure from listening to my belly -- he swears he hears gurgling and swishing, but I'm sure that it was just my afternoon sandwich and banana.